When making the choice to homeschool, it’s best to have both mom and dad involved in the decision. Even if Dad gives a solid yes to becoming a homeschooling family, he might have a few concerns about what the future holds for your adventures in homeschooling. Here are five common homeschool dad fears and how you, mom, can help put his mind at ease. Homeschool Dad Fear #1: You will always be stressed out. Let’s be honest—homeschooling can be a lot of work. While there are days that are wonderfully fun and rewarding, there are other days that just aren’t that great. Simply put, some days are a struggle. We’ve all heard the phrase if mama ain’t happy, ain’t nobody happy. Dad understands this. Dad knows what this means and what happens in the house when mama is having a hard time. Now, imagine a rough day… or week… or month of homeschooling. Is Mama going to be happy? Is anyone else going to be happy? How you can help calm this fear: Admit there will be hard days. Let him know that you will be honest about how you’re feeling, and when you need a break. Have a plan in place to help you de-stress. Promise him that if you feel overwhelmed, you will tell him. Talk about steps you will take to get through the bad days. This is so much easier than pretending they aren’t going to happen! Homeschool Dad Fear #2: You will always be in teacher mode. We’ve all seen the “Hey Girl” Ryan Reynolds memes. While these are a funny exaggeration of what some homeschool moms might see as fantasy (discussing curriculum all. night. long!) it’s natural for homeschool dads to wonder Wait. Will our whole life now become homeschooling? Will we be discussing curriculum all night long? Will my wife always be stuck in teacher mode? Will I feel like I’m back at school? After making such a huge commitment to your children’s education, Dad is mostly fearful that you’ll lose yourself. He knows that you are so much more than any one thing—most of all you’re the gal he loves. He doesn’t want the home you’ve built together to turn into some resemblance of a brick and mortar where you stand slapping a ruler over your palm to get someone’s attention. How you can help calm this fear: Remember, you’re not just a teacher! Homeschooling can sometimes be overwhelming, and in some stages of the game, you can feel like your brain really is stuck in teacher mode. Talk with your husband and make it a priority to set aside a night (at least once a month) where you both promise not to talk about homeschool or the kids. Homeschool Dad Fear #3: You’ll expect him to do more than he thought he agreed to. While Dad may have agreed about having the kids be homeschooled, he may not have agreed to teaching subjects with you. In some families, Dad saying yes simply means have at it, Mom! Unfortunately, sometimes we mistakenly assume this means Dad will be constantly helping us with homeschooling subjects and projects. Dad may find himself in the middle of an argument he wasn’t aware he’d started! How you can help calm this fear: Clear communication is a must. Have a conversation early on about how involved you will both be in the homeschooling experience. Make sure you’re both on the same page regarding who is (or isn’t) responsible for what, and be willing to reassess the set-up often. Homeschool Dad Fear #4: You won’t let him get involved. He will get shut out. On the other hand, Dad may be afraid that with all the time you and the kids are spending together, he will be forgotten. He might look into the future and see a little secret society made up of Mom and Kids where he doesn’t know the password or the secret handshake. How you can help calm this fear: Again, talk early in the decision making process about how involved both of you will be in all aspects of homeschooling. Make sure the lines of communication are open so that if Dad feels he’s being shut out or that you and the kids have turned into a secret club, he has the opportunity to speak up about it. Also, if it starts to feel like you and the kids have a lot of inside jokes or things Dad isn’t privy to understanding, it might be time to assess if you’re including Dad as much as he’d like to be involved. Homeschool Dad Fear #5: You will both disagree on what, how, or when things are taught. What happens if you want to teach a topic that Dad doesn’t want taught at a certain time or in a certain way to the kids? What if Dad thinks unschooling is the best method for home education, and you think it’s completely out of the question? What if Dad has something he’d like to do with the kids and it’s in direct opposition to something you’ve got planned? What if Dad thinks things should be more planned out than how you run things? What if he thinks you’re too relaxed? How you can help calm this fear: I’ll say it again, communication is the key! 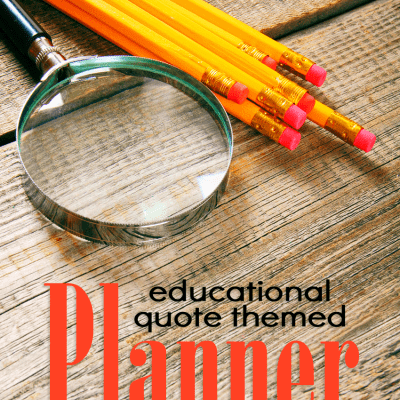 Make a point to discuss different homeschooling methods and timelines for different topics. Remember to take advantage of the flexibility that homeschooling offers, and be respectfully open to each other’s opinions and suggestions about how to do things differently. Homeschooling is so much easier when mom and dad understand each other. 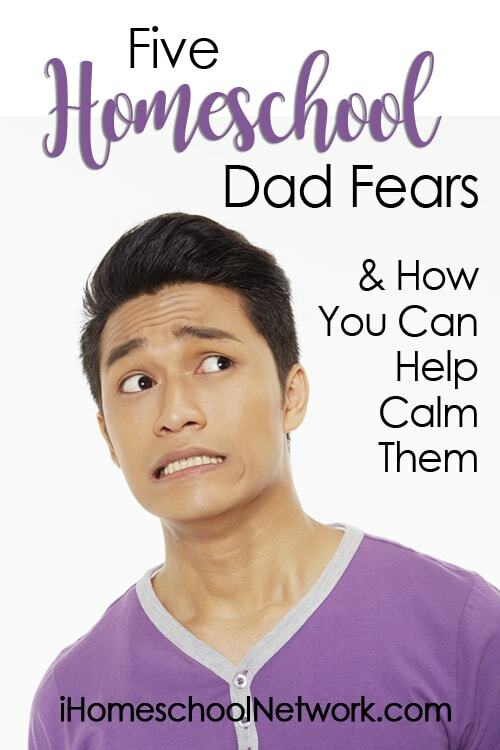 By knowing the common concerns homeschooling dads have, you can help to calm his fears about your upcoming homeschool adventure.